Illinois notches new all-time high in payroll jobs. The Illinois Department of Employment Security (IDES), which compiles Illinois nonfarm payroll job numbers in cooperation with the U.S. Bureau of Labor Statistics, announced this week that revised employment numbers for January 2018 show that Illinois has notched a new peak employment level. The revised statistics show that nearly 6.1 million men and women were employed on Illinois-based nonfarm payroll jobs in January 2018. The new high was achieved as the result of net new jobs that had been created in calendar year 2017 within Illinois. Much of Illinois’ job growth in 2017 came in the manufacturing industry. Almost one-half (20,200 of 47,100) of the net new jobs created in Illinois in 2017 were created in this long-troubled industrial sector. There has been a major structural shift in Illinois manufacturing in recent years, with old assembly-line factories continuing to close down. Replacement jobs are created in smaller, nimble plants equipped with “smart” tooling solutions. In many cases, the workers hired in these new plants have specialty certifications from community colleges and other employment-oriented educational institutions. With its vast road and railroad network, Illinois is well adapted to serve as a location site for the manufacturing of goods through a multi-site finishing process. Many Illinois-manufactured goods are begun and finished in a geographic process that involves moving goods in transit from one finishing site to another. Illinois continues to underperform other U.S. states in overall job creation and job growth. Illinois’ revised January 2018 unemployment rate of 4.8% was 0.7% higher than the overall national unemployment rate of 4.1% for the same month. In neighboring Indiana, the unemployment rate for January 2018 was only 3.3%. The IDES announcement was released on Monday, March 12. General Assembly passes bill to reduce cost of consumer credit freeze actions to $0. The reduction affects consumer decisions to place a freeze, remove a freeze, or temporarily lift a security freeze on their credit rating report. The legislation passed by the Illinois General Assembly as HB 4095 reduces burdens on consumers if their confidential information has been breached. The House had previously passed HB 4095 by a bipartisan vote of 109-0-0. The Senate’s approval of the bill on Wednesday, March 14 will enable the measure to be sent to Gov. Rauner for final action. House Republican members sponsor bill, resolution to abolish seasonal clock changes. The bill from Rep. Steve Andersson calls for completing Illinois’s commitment to daylight savings time by making the one-hour-ahead time permanent all year round. Daylight savings time, which was long-ago called “summer time,” was once observed only during the warm weather months. As time has passed, the daylight savings time months have become longer. Under current law, daylight savings time stretches from mid-March until early in November. In 2018, Illinois residents switched over to Central Daylight Time on Sunday, March 11. Many people believe that the requirement to switch clock time twice a year imposes an unnecessary, onerous burden upon their lives. Productivity studies appear to agree. Two U.S. states, Arizona and Hawaii, have abolished the semi-annual time changes within their state lines. Other states, such as Florida, have similar bills pending in their legislatures. Rep. Andersson’s bill to make daylight savings time year-round in Illinois is HB 424. A parallel resolution, HR 731, has been filed by Rep. Tom Bennett. Bennett’s resolution urges Congress to enact permanent Daylight Savings Time in all 50 states. Gov. Rauner vetoes measure to impose regulatory regime on Illinois firearms retailers. The Governor noted that the retail sale of firearms in every state, including Illinois, is already regulated by the federal government. In his veto message, Rauner pointed out that the proposed Illinois law, SB 1657, would not affect the regulations that govern the transfers of firearms in other states and asked the General Assembly to develop new ideas to “stop the illegal flow of guns into Illinois.” By contrast, the Governor characterized SB 1657 as “burdensome regulation” that would have laid a heavy enforcement load upon more than 2,700 small businesses throughout Illinois. The vetoed measure would have required Illinois firearms retailers to obtain special secondary licenses from the State to match the licenses they are already required to obtain from the U.S. Bureau of Alcohol, Tobacco, Firearms and Explosives. Gov. Rauner pointed in his veto message returning SB 1657 to efforts within his administration and amongst people of goodwill to build upon work already being done by the Illinois Terrorism Task Force. The Terrorism Task Force has convened working groups of officials from schools, police and fire agencies (first responders), and the mental health community to fight to keep guns out of the hands of criminals and persons who suffer from mentally illness. The Governor’s veto message, filed on Tuesday, March 13, returned SB 1657 to the Senate for further discussion. A three-fifths majority in both houses would be required to override the Governor’s veto. Key federal aid bill signed by Gov. Rauner. The Governor’s signature on SB 1773 moves Illinois closer to renewing its claim to get $3.5 billion in health care aid payments from the federal government. Federal matching grants of Medicaid money to individual states are paid out by Washington, DC on a contingency basis. Nothing is paid unless each state fulfills the terms of a series of federal mandates. 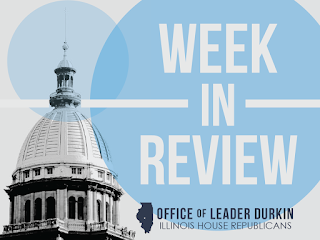 SB 1773 was negotiated on a bipartisan basis in the General Assembly, with legislators working closely with representatives of Illinois hospitals and health-care providers who are on the frontlines of providing care to patients. With House Republican Deputy Leader Patti Bellock and others warning colleagues that the current Medicaid funding stream was set to expire at the end of June 2018, bipartisan negotiations began in earnest and an agreement was reached. SB 1773 will move forward the process to keep funding Illinois “safety-net” hospitals, including health care facilities that provide services in rural sections of the State. Illinois hospitals hailed passage and enactment of the legislation. Hospitals will be strongly encouraged to offer more urgent care and outpatient care to their patient populations. SB 1773 was signed on Monday, March 12. It became P.A. 100-581. Railroad capital plan includes $103.6 million for Illinois. The Union Pacific (UP), one of America’s Class I railroads, operates extensive trackage throughout many regions of the state. UP railroad service covers many Illinois industrial parks and enterprise zones. In the railroad’s 2018 capital spending plan, unveiled this week, UP will invest a nine-figure sum in Illinois track and bridge maintenance and repair. Of particular note was the railroad’s plan to completely replace 49 miles of rail on the former Chicago & Eastern Illinois line south of Chicago. The line connects Chicago Heights with Watseka, Illinois, and includes trackage in eastern Will County that is seen by many investors as ripe for development. UP has previously developed similar trackage in and around Rochelle, Illinois into a major logistics hub with light industry and semi-trailer road on-load/off-load solution capabilities. Governor returns to State Veterans Home, announces moves to explore new dorm complex and cut red tape. In his visit to Quincy on Thursday, March 15, Gov. Bruce Rauner reported on the State’s continuing partnership with the federal Centers for Disease Control and Prevention to develop long-term plans for the Veterans Home. The State Capital Development Board is issuing a Request for Proposals (RFP) for a Master Planning contract to explore building a new residential facility on the Quincy campus. The State will also move towards purchasing a vacant private-sector nursing facility building, the Sycamore Health Care Building, in the Quincy Home neighborhood to serve as a potential place for residents to live should current remediation steps be less than 100% effective at dealing with the recent health challenge that has plagued the current facility. As immediate steps for current Quincy residents, new water filters, faucets, and bacteria-monitoring equipment have been installed for the 130-year-old residential facility. Although the state Procurement Code requires almost all major State purchases of this type to be run through a lengthy process of bids and notifications, Gov. Rauner has taken steps to ensure that the Department of Veterans Affairs will get these essential goods as soon as possible. An outbreak of Legionella bacteria, responsible for the dangerous illness “Legionnaire’s disease,” has affected day-to-day life at the Quincy Veterans Home. A $6.3 million water purification system has been installed at the Veterans Home. More than 750 new faucets with micron filters designed to filter out the bacteria have been installed. There have been no positive water tests for Legionella since completion of the latest round of renovations. Bicentennial celebration intensifies, goes up on video. The “BORN, BUILT & GROWN” campaign is set to celebrate pride in Illinois with a focus on our State’s 200th birthday. The private-sector-funded, crowd-supported operation will discuss Illinois experiences of today in the context of major achievements and shared memories from the past. In addition to video streaming, the spots are being packaged for sponsorship on cable and over-the-air by local advertisers as opportunities to build community goodwill. BORN, BUILT & GROWN ads will be renewed until the conclusion of the Bicentennial year on December 3, 2018. The video segments will concentrate on music, sports, agriculture, literature, commerce, history, technology, transportation, art and architecture. Ancillary pieces will be packaged for radio, print, outdoor, digital, and social media. Ad renewal will be dependent on the support of all Illinoisans.